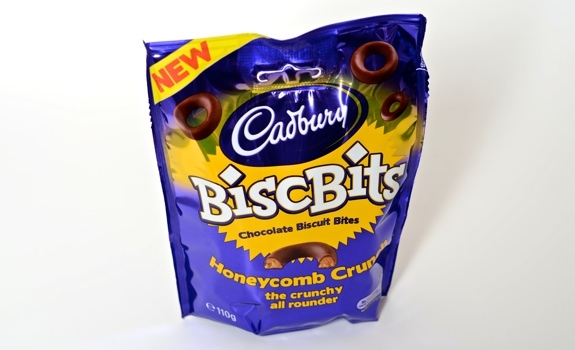 Cadbury BiscBits Honeycomb Crunch. See that “NEW” banner at the top? Yeah. I did, too. Another week, and another mission to my amazing neighbourhood U.K. import shop, British Pantry. So many boxes brimming with temptations, both sweet and savoury, yet so little time/treasure. This trip, I brought back a small bag of Cadbury BiscBits, a treat I’d never met before, that featured the tantalizing “NEW” in a banner on the corner. There were another couple of flavours, too; I seem to remember a mint one and an orange one. Honeycomb seemed the most exotic, so that’s what I bought. The Closure: Instead of a ziplock-style closure, the bag combines an easy-tear mark on the top with a peel-and-stick sticker; the idea is to roll the bag shut, then use the sticker to keep the rolled-top firmly in place against the exterior side of the bag. I don’t like it; the stupid thing kept coming undone. The Taste: I know they’re referred to as biscuit bites, but “Honeycomb Crunch” led me to believe they might be more in line with honeycomb/sponge toffee than a standard biscuit/cookie. I was wrong. 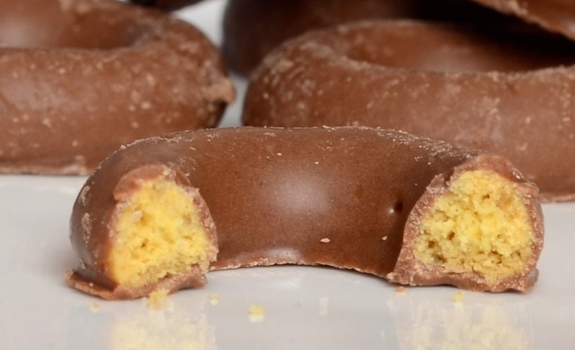 They are crunchy, chocolate-coated biscuits that taste like sponge toffee. While they weren’t what I was expecting, they’re really quite nice. 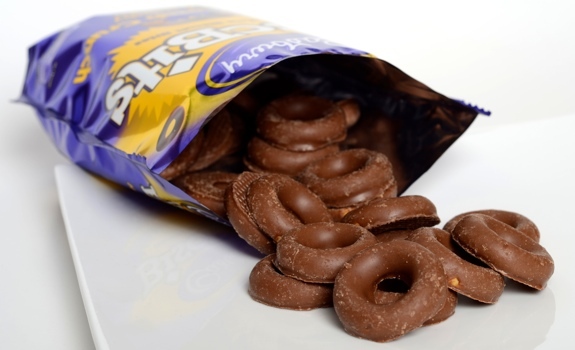 Sweet British milk chocolate melts away to reveal a crunchy cookie core. The cookie’s texture is pleasantly grainy and scratchy, and the overall taste is satisfyingly rounded. It’s the sort of treat that seems simple at first, but the more of them you eat the more you notice the complexity of the flavour. Cost: $4.99 for a 110 gram bag at British Pantry in Calgary. Value for cash money: OK. Availability: Limited in Canada, near as I can tell. Check U.K. import shops. Nutrition? : Per 7 biscuits (25.1 grams): 120 calories, 5.2 grams of fat, 60 mg of sodium, 0.3 grams of fibre, 1.5 grams of protein. The verdict: Not bad at all. Seemed like a disappointment at first, then grew on me. Would be great with tea. The biscuit centre, exposed! Kind of looks like honeycomb/sponge toffee, doesn’t it?